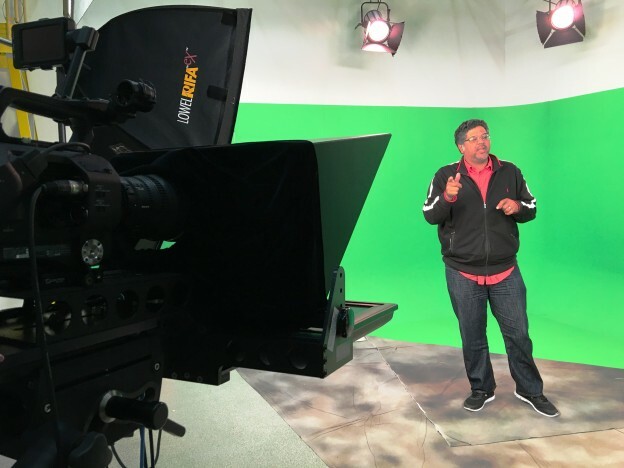 Aaron Hosé, lead video producer at the University of Central Florida's Center for Distributed Learning, stands in the CDL video studio on campus in Orlando. Photo by Rick Brunson. For generations of journalists, that’s been the sturdy, time-tested mantra of good writing. The same could also be said for good teaching. Show, don’t tell – especially when it comes to teaching online. For showing course content that engages students and promotes learning, nothing beats video. Today’s successful online educators are also likely to be proficient videographers. But what makes “good’’ video? And how can educators, particularly those who teach in online or hybrid, mixed-mode environments, produce better video? Most importantly, how and what does effective video contribute to student learning? Hosé, whose department of four videographers produces 200 to 300 videos per year – from script to delivery – for online and mixed-mode classes at UCF, says the starting point is to think like a student. But what does “quality’’ mean? Quality starts with the educator’s purpose for even using video. Video for video’s sake doesn’t work. What does the faculty member hope to accomplish with video? What concepts and skills can video communicate better than other modes of content delivery, such as live-streaming a lecture or a narrated PowerPoint presentation? At UCF, Hosé says the two most popular types of video with students and faculty are demonstration videos and expert testimony videos. Demonstration videos depict a process and show how something works. For example, Hosé’s team produced a video for a UCF physics professor that demonstrates the concept of resonance among celestial bodies. For a hospitality management course, the team produced a video that demonstrates how to sauté salmon. Expert testimony video showcases authorities in their field sharing insights about concepts, skills or best practices in their work environment. In my own News Reporting course at UCF, I recently produced a video with a local reporter at the Orlando Sentinel, Gal Tziperman Lotan, introducing the difficult skill of writing effective lead sentences for breaking news stories. I shot the video in the Sentinel’s newsroom. I call these kinds of short, chunky videos that introduce concepts the “chips and salsa” of online education. They’re like a spicy appetizer that gets students ready for the main course. 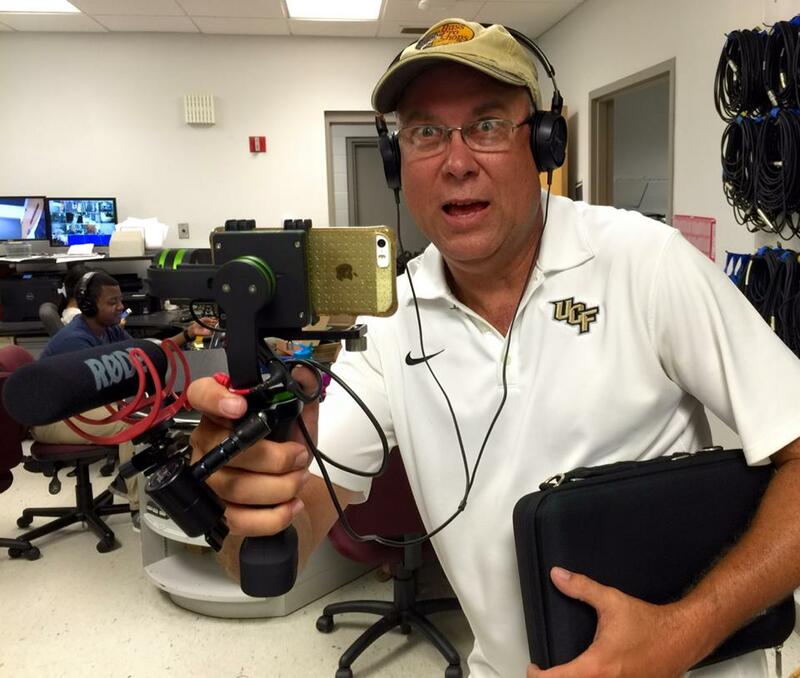 UCF journalism instructor Rick Brunson uses a gimbal to stabilize his video and an external microphone to improve sound quality. That’s great advice. Our journalism program at UCF is about 80 percent young, female and ethnically diverse. So I try to keep my instructional videos aspirational and reflective of that reality. My students hear from people like themselves who are successful at what they do. Whether you go with a demonstration video or an expert testimony video, you want the final product to be as attractive as possible. That means deploying standard best practices of good video: solid composition and rule-of-thirds framing that creates visually interesting shots; a wide variety of shots (wide, medium, tight, super tight); enticing natural sound and audio levels that enhance that sound; good exposure and lighting that make the subject pleasing to the eye; and clean editing that features smooth transitions from shot to shot and from sound to sound. But what if you don’t know how to produce a quality video? If your college or university has a video department, work with it to produce your videos. Hosé’s [email protected] team at UCF has four producers who consult with faculty and write, shoot, direct and edit video with professional equipment. The team boasts an on-campus 1,600-square-foot studio equipped with Sony FS7 4K cameras, multiple lenses, full lighting rig, a green screen, five editing suites and an audio booth. Hosé and his team can also hit the road and shoot video afield, if needed. “I joke that CDL stands for ‘Can Do League,’’’ Hosé says. If your college doesn’t have such resources, Hosé suggests contacting the communications or digital media department on your campus and reaching out to students or graduate assistants there who may be looking for project work for class credit. A third option is to scour the Internet for existing, non-copyrighted video tutorials that cover content in your subject area. That’s what I chose to do. The best $75 I ever spent was on an all-day Saturday hands-on videography short course taught by Suzette Laboy in 2007, who at the time was a veteran video reporter for the Associated Press. I added to those basic skills others taught by Al Tompkins at the Poynter Institute. I started with an inexpensive $75 RCA Wonder video camera and then moved to the iPhone. External microphone for capturing good sound. A tripod or gimbal to make your video stabile. Good editing software such as Adobe Premiere or iMovie. So, assuming you acquire some basic skills and gear, what’s next? Timing is everything. The time length of your video is the key to engaging your students. But the length of the video isn’t the only factor that determines impact of video on student learning. Video use must be coupled with assessment. Chen’s research shows that learning increases if the instructor integrates assessment with the video lesson, especially if the video content is tied to a writing assignment or a short, multiple-choice quiz that is automatically graded and provides immediate feedback. “It helps them connect the video content with the overall course content,’’ Chen says. Students agree. An anonymous survey of 50 UCF students about how video helps them learn revealed the following: keep it short, keep it interesting, keep it focused on relevant concepts and skills and keep it tied to assessment. Rick Brunson is associate instructor of journalism in the Nicholson School of Communication at the University of Central Florida where he teaches news reporting, mobile reporting, editing and principles of journalism in face-to-face, mixed-mode and fully online modalities.